Have you ever had someone gasp in horror when they discovered your dog sleeps on your bed? Perhaps you’re a dog owner that wouldn’t dream of letting your dog in the bedroom? Maybe you and your partner have heated debates about whether the dog can join you to catch some Zs. Or, perhaps you're one of those people that always ends up with the smallest sliver of space, right at the edge, while your dog sprawls out over the rest of your king size bed. When it comes to this topic of debate, there is not a right or wrong approach. You just have to be aware of the pros and cons and make an informed choice. If you let your dog sleep on your bed, don’t worry, you’re not alone. An article published in the journal Human Nature in 2017 suggested that around half of all dog owners let them sleep in or on the bed. The article also suggested that, while there can be problems that arise from this habit, the feeling of contentment it can create often outweighs these. Will It Impact the Quality of Your Sleep? There is no denying that sharing a bed with any species can disrupt your sleep. Dogs sleeping patterns are different from ours, and it is not unusual for a dog to wake you up at the crack of dawn for their breakfast. In 2018, a study was published in the Anthrozoos Journal. The results suggested that women generally slept better and felt greater security and comfort sharing a bed with a dog than they did with a human partner! If you have a new puppy or rescue dog, sometimes allowing them to sleep in your bedroom will cause less disruption as they are more likely to settle being in your company. Be aware though, if you do let them sleep in your room at first, making a transition to another arrangement later will be more of a challenge. It is best to start as you mean to go on. There are often comments on how unhygienic it is to have dogs on the bed and that there is a risk of spreading zoonotic diseases (sicknesses that can be passed between species). Provided your dog is bathed enough, receives regular veterinary check-ups, and is treated with appropriate parasitic preventatives, then the risk is incredibly small. You should also consider that two-thirds of human diseases are zoonotic, so there may be a higher risk of you passing something to your dog. Will Your Dog Try to Dominate You If You Let Him Sleep on the Bed? Some people suggest that a dog afforded equal status and allowed to sleep on your bed will try to dominate you. This "Alpha Pack" mentality towards dog behavior has been widely discredited. Although your dog may not be trying to dominate you, they can become possessive towards items of high value to them, like a super comfortable bed. They may start growling if another pet, your partner, or even a child, approaches. This is something that should not be allowed to develop. Teach your dog that if they trade what they are guarding they will get something better. So, if your dog comes off the bed, they will get a super tasty treat or, your partner can reward them for allowing them on the bed without any fuss. Resource guarding can escalate if not handled correctly. If you are concerned, we would recommend consulting a qualified behaviorist. When Might It Be More Appropriate for Your Dog to Have Other Sleeping Arrangements? If you choose to have your dog sleep elsewhere, provided you are consistent, make sure they have a comfortable space and are rewarded for going there; there is nothing wrong with this. There is a chance that your new pup could have an accident on your bed and their youthful exuberance may result in you having an interrupted night sleep. By settling your puppy in a crate, accidents will likely be fewer and easier to clean up, and it reduces their access to chewable items. You may decide to have the crate in the bedroom, so the pup still has close contact. Some elderly dogs can develop incontinence and may be more likely to have an accident throughout the night. You could use doggy diapers or, if you do want to move them off the bed, remember that they have been used to sleeping there. It could be confusing and distressing for them if you suddenly shut them downstairs and expect them to stay there. Moving them must be done with lots of positive reinforcement and may need to be done gradually. For dog’s that have mobility issues, getting onto and off the bed can prove challenging, and it can be dangerous if they take a tumble. You could opt to splurge on a futon style bed that is low to the ground or invest in a set of doggy steps. If you are living in a multi-dog household, having them all on the bed may not be practical. A good nights sleep may be elusive, and scuffles over space or being closest to their person can break out. Some dogs will all sleep harmoniously on the bed together and, if you want to be surrounded by multiple dogs through the night, then perhaps the lack of space is something you are willing to tolerate! 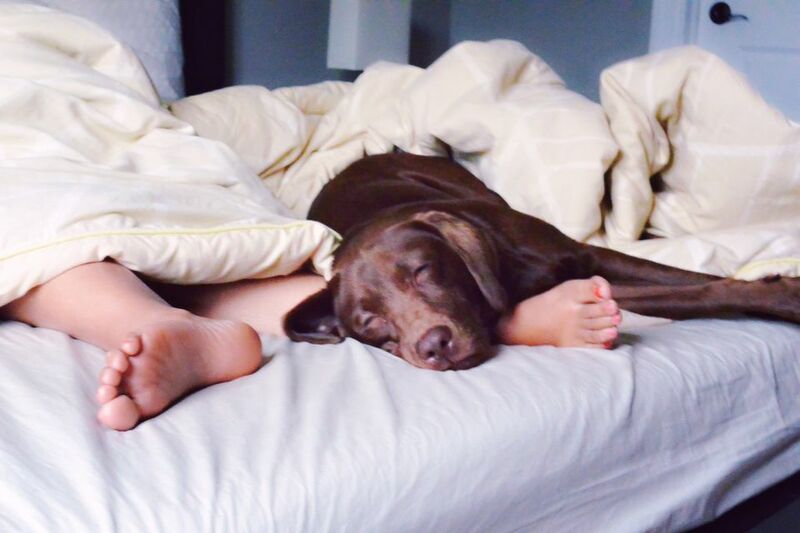 If you have children co-sleeping with you, consider whether it is still appropriate to have your dog on the bed, too. Your child may not be so careful ensuring they don’t roll onto or step on a sleeping dog, and even the best-natured dog can react negatively if they get frightened or are in pain.